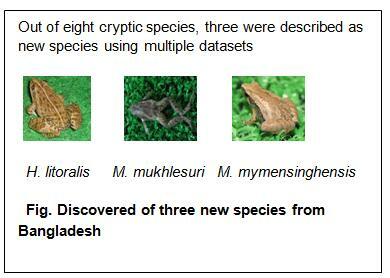 I am interested to disclose hitherto overlooked cryptic biodiversity of Bangladesh anurans using DNA barcdoning approach/molecular technique, pre- and post-mating isolation methods. The dispersal and evolving of the herp-life of Bangladesh despite rather simple topographic feature of the country made me enthusiastic to devote myself to making a shed light on the blurred herpatofauna of this disdain developing country. Utilizing my background in cryptic biodiversity with combination on molecular systematics, recently I am working on Indonesian Fejervarya frogs to know their evolutionary history, particularly frogs from Lesser Sunda, Indonesia and other Asian countries. 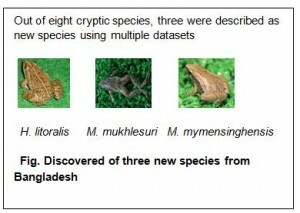 Currently, I am also working the biodiversity of fishes in Bangladesh. Many fish species may be undiscovered in Bangladesh, i assume. I would like to collaborate with any institute/organization to discover these hidden fish species.